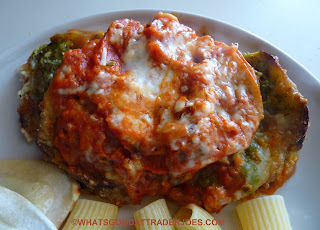 If someone asks you if you've tried "Trader Joe's Eggplant Parm," you've got to ask them if they mean this Stacked Eggplant Parmesan or, you know, that other abomination. 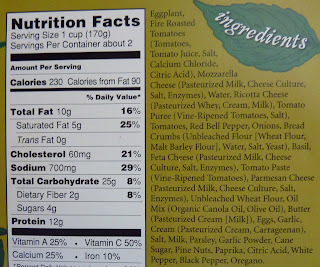 Because in my opinion, this stuff is in every way superior to that Trader Giotto's eggplant dish that comes in a tray. 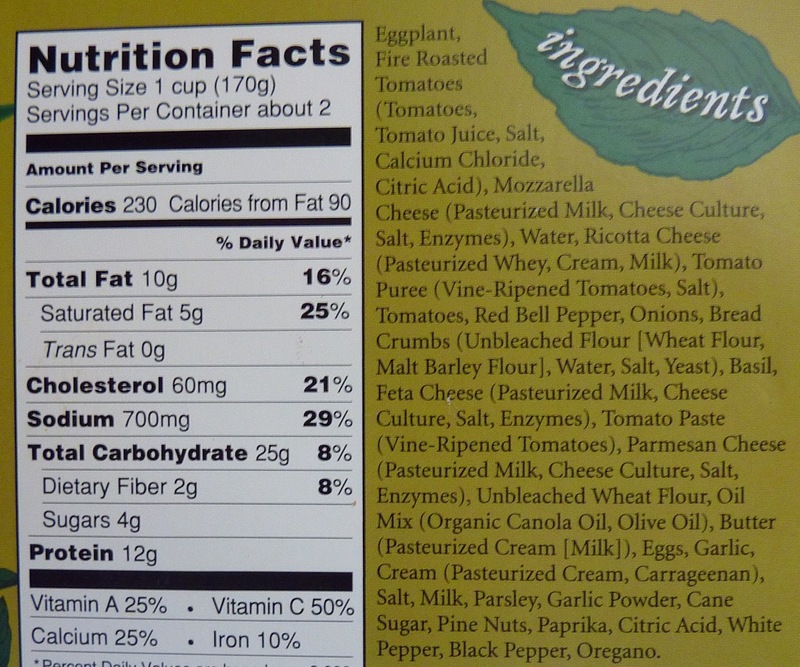 The nutrition info for both products is comparable, although the serving size for the Stacked is somewhat smaller than the other dish. The only good thing about Trader Giotto's Eggplant Parm is that our review of it sparked a dialogue about this delicious offering. I'm super glad we tried it. Far from being chewy like the previously-reviewed parm, the stacked variety, if anything, is too supple and soft. I understand some people prefer their eggplant on the crispy side. If you're in that boat, then I guess you might have a legitimate complaint about this particular product. I felt like it flaunted a nice "melt-in-your-mouth" quality, but Sonia thought it fell apart a little too easily. That's not to say she didn't enjoy it. She loved the flavor. And what's not to love? It's a collection of every stereotypical tasty ingredient commonly found in Italian food all mixed in and "stacked" on amazing eggplant. Especially impressive was the ricotta cheese. Tomato, bell pepper, and bread crumbs help round out the taste and texture. We ate ours with pasta, and it worked really well. I'd be perfectly happy eating this dish all by itself, or you could slap a slab of this in between some quality Italian bread and make a sandwich of sorts. I'm not known for my culinary creativity, but I'm sure some of you guys have come up with some interesting ways to eat this entree. Apparently there's a third TJ's brand eggplant parm product that has somehow eluded us up to this point: Trader Giotto's Eggplant Parmesan Towers. Let us know if any of you have tried that one and we'll add it to our shopping list. Sonia and I haven't been on a proper TJ's run in a hot minute—we actually had these stacked eggplant parms a while back—but now we know there's a Pokéstop right next to the local TJ's, we have another good reason to go! Never thought of putting it between two slices..... its pretty good for a TJ product... our packaging shows the word 'grilled'....or is there a similar eggplant pkg.? If we're talking about the same product, you're right, it wasn't mushy. It had the consistency of leather! after several messy, sloppy attempts to bread and fry eggplant myself, i asked my mother what her secret was. first, she told me that breading things was really easy and was i using enough milk? then she said, now i just use the trader joe's - so easy to make and no mess. I tried this for the first time last week and I really loved it. I wasn't a fan of the Trader Giotto's one either. It wasn't bad, but I just didn't care for the flavor. Just tried this for the first time, microwaved - 7 min. Turned out DELICIOUS! I've had 3 of these. Two I loved, but the third was not good. I don't know if it was just bad luck or a change in suppliers. Still, will definitely repurchase and hope. Want to make this the perfect easy TJ's meal?? Toss in a couple of their grilled meatballs. It's actually my menu for dinner tonight! SO good and sooooo fast/easy! 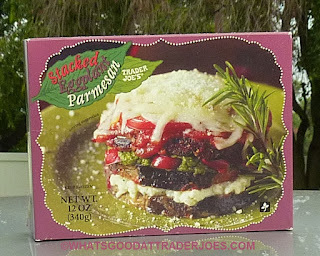 We have the stacked Eggplant Parmesan from Trader Joe's at *least* ince a month. IMO, a restaurant could get away with serving this and get rave reviews. Try only the kind discussed in this article. You won't be sorry?